(TibetanReview.net, Mar07, 2015) – Nearly 18,000 students of Tibet Autonomous Region were studying in schools not in their home region but in Tibetan classes in schools in 21 provinces and cities of China in 2014, according to China’s official Xinhua news agency Mar 5. China claims that this officially sponsored and implemented project is meant to help train professionals for Tibet’s development. Critics contend, however, that the project, started in 1985, is meant to remove Tibetans from their cultural root and identity with a view to nurture them as people with Chinese habits and mentality. Most of the nearly 15,000 high school and 3,000 vocational school students were of Tibetan ethnicity or from other minority groups, Ma Shengchang, the region’s education department head, was cited as saying at an annual educational work conference held earlier in the week. Seventy percent of the students were said to be from farming and herding families. 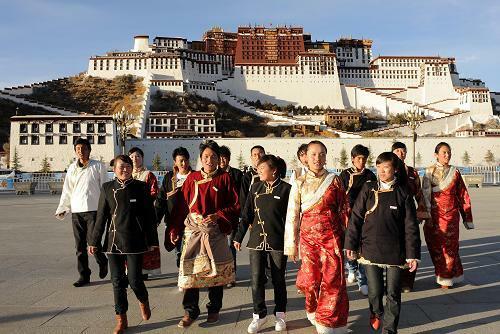 The report said China had been sending Tibetan students to study at high schools in mainland Chinese cities since 1985. The exile Tibetan administration has been severely criticizing this as a project for the assimilation of Tibetan Plateau region and to destroy its cultural identity.